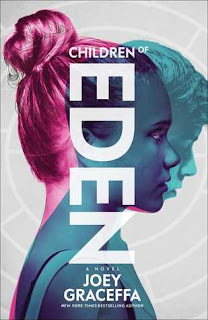 After seeing the beautiful cover and reading the synopsis, I couldn't say no when asked to read Children of Eden. I'll be honest, I'm not super hip in the YouTube world, so I wasn't familiar with Joey Graceffa prior to reading The Children of Eden. Another little bit of honesty... I'm so glad I picked up this book! The plot wasn't completely original, but after so many dystopian books I think it probably gets a little difficult to come up with a completely original story line. Although it had similarities to The Hunger Games and Divergent, it also had plenty of originality. I was completely drawn into the word Graceffa created and was able to imagine my own version of it perfectly. At times, I found myself wondering what my life would be like in Eden. Children of Eden was fast paced with constant twists, and it was filled with high intensity action scenes that left me constantly wanting more. I was thoroughly entertained and found myself unable to put the book down. As I got closer to the end of the novel, I had more and more questions unanswered, which leads me to believe (crossing my fingers) there will be a second book about Rowan and her adventures. All in all, I thoroughly enjoyed the story and hope to read more from Graceffa in the future. The Children of Eden was a fun, entertaining, and quick read that fans of the dystopian genre are sure to enjoy. This book went on sale yesterday so head on out to your nearest bookstore and pick it up! I have wanted to pick up this book and thanks to your review I think I am definitely going to get it in my next book order! Thank you!